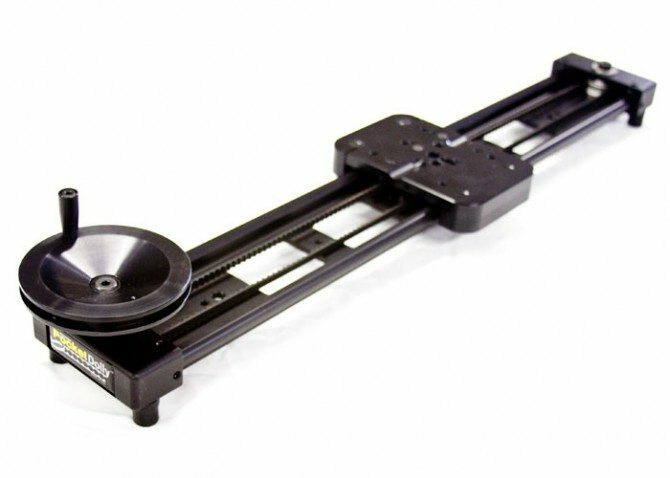 Kessler Crane Pocket Dolly V2 released! I have recently developed a close relationship with Kessler Crane, mainly as they are great guys with great products who have been working with me on what they need to do to make their sliders better. Part of the issue with most sliders I have used in the past, including the glidetrack and the old pocket dolly is they used the IGUS system which while great was never perfect. It can stick so you often have to repeat the shot to get it smooth. Although their pocket dolly with crank improved things so much making this stickiness not happen. To improve performance Kessler have gone to a system similar to what they have in their top of the range Cineslider system. They are using a ball bearing system, coupled with the belt to give it inertia, it creates a smooth as a baby’s bottom slider that is now what I call a one take slider. The only time you need to do the shot again is if you screw up rather than the slider sticking. The other cool thing is it’s silent. I have used all the sliders I can think off and the problem with most of them is they simply are not quiet, making recording sound a real issue. This is the first smooth slider I have used that is silent. It comes in two lengths, the traveller and the normal size. The thing I love about the traveller is it packs into my suitcase. A big plus. Although I of course prefer the longer version for more flexibility so if you don’t live out of a suitcase like me that is the one to get! I know without a doubt some people will complain that they have brought out an improved version if they have bought v1, but that is nature of gear. Improvements are always being made and I would rather companies bring them out than sit on them for a year because they don’t want people to be upset that they have something not as good…the v1 is still great…kessler are just always striving to make improvements, like Zacuto. That should be applauded not complained about. Below is a timelapse film I made from the set of Lucasfilm’s new movie “Red Tails”. All the motorised shots were done with a prototype Traveller version of the V2 pocket dolly and the Elektra Drive system with the 500 motor and Oracle Controller. Lucasfilm’s “Red Tails” on set Timelapse from Philip Bloom on Vimeo. This is the joy of the Pocket Dolly V2 system. It’s the baby brother of the Cineslider, the gold standard of sliders which can take heavier cameras, but it performs as smoothy and that is key. This really is the smoothest slider I have ever used, combined with the flexibility of using “manually” or motorises with the Elektra drive system to create a motion controlled slider for both timelapse and normal video use makes this for me the best on the market by far. That is why I have developed a close relationship with them and we will be working even closer in the future to make great products. Don’t forget, if anyone can make the Key West meet up on the 29th June, Eric Kessler will be there with the toys as will I and Tom Guilmette. It’s going to be a shooting meet up. It will be a blast! You can order from Kessler Crane by clicking on the banner below. seems to be a great buy compared to the Cine Slider. Well shoot. The thing I don’t like about my 1st version slider is the fact that it sticks. Glad they came out with something better. Wish they would have implemented it sooner. like any product, things get better and we will be disappointed that there is something better out, but it’s the same with everything, just like the new iphone! They looked at how to make their product better and so have released the V2. I’m sorry to rant on my first post here but this is getting ridiculous! First, it was the Z-finder and now the Pocket Dolly that I bought a few months ago just to have much better versions made right after! I did not realize how much the fogging in the Z-finder would be a pain and no reviews of the Pocket Dolly mentioned that it DOES stick and messes up your takes…I really thought that it came from my lack of experience with it. Sorry again but I’m very frustrated right now. Relax Richard. That is the nature of gear, improvements are always being made…better than them sitting on their arses doing f all! Sorry Philip, it’s just that the cash is hurting a bit 🙂 I’ll contact Zacuto and Kessler Crane to see what they can do. Hi Phillip, thanks for the review. Looks like another really well engineered product. Question: Have you used Cinevate’s Atlas or Carbon rod system? I know they are slightly different animals, but accomplish some of the same shots. Just curious as to why I’ve never seen you mention their products. (It’s probably me, don’t have time to read everything, unfortunately). Any thoughts about Cinevate? Glad to here it is smooth and best of all “one take”. I’ve been kinda disappointed with the glidetrack as I have missed some critical action shots because it can stick some times, Although on the flip side it has also produced some stellar shots as well. Question about this kesslar, when the slider is set on a tripod do you use the little handle on the wheel to “slide” the camera or do you push it like a glidetrack slider? If you do use the wheel does that introduce unwanted movement into the shot? you can add a motor to the Cine Slider ? I’m not entirely clear here. So, this new pocket dolly 2 is smoother than the CineSlider… or they are the same? Thanks for the review and the link to order one. Philip, thanks for the informative review =) Have you had a chance to play with Cinevate’s Atlas slider? It’s also ball bearing based, and from what I hear is not silent. But I’m very curious how they compare! Again, your video is BADASS as usual, what I want to know though is how and where do you find your music selections? It seems like you’ve always picked the perfect music to go with the music to set the mood, just how do you do it Phil? I have only maybe 2 or 3 songs that I could think off the top of my head, been trying to find more using Pandora and Last.fm with not much luck, any tips on where I could go about acquiring musics such as these to use on the video? Love the site. What is the best way to mount the Pocket Dolly to your tripod. In the salton sea film it looked like you had some custom plates between the tripod and the pocket dolly. Do you need the hercules head for the regular size pocket dolly? Hi, am looking to order one of these soon. I am trying to figure out if the Oracle is worth buying over the basic controller. It is $750 dollars more and from what I can see the basic one has speed control and direction which seems enough. Did you use any of the extra features on the oracle? Also the 500 series motor looks like to only one worth getting, why get a faster one?? the oracle is programmable so it can move the dolly on it’s own. the extra features of the oracle are worth it for me with regards to that and timelapse. the motors are for different functions and different dollys. worth checking with kessler before ordering. Looks like could build this one with use of parts inside an old scanner use the stepper motors and rails and program the movements and speed. this thing is perfect! its light weight, easy to setup, smooth, and SILENT. my footage might be a bit shaky due the the track not being level… user error, not an issue with the dolly. Hi Philip, we met in LA at your awesome workshop, I’m the Brit with the American accent you couldn’t quite work out… lol. 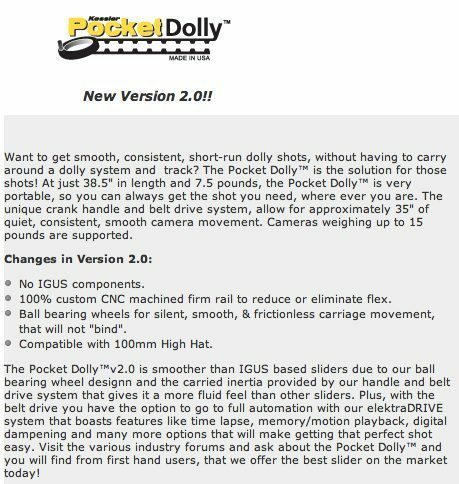 I’m looking to get a pocket dolly. Yea!. A couple of questions for you in light of your experience with it. Have you traveled with the 3 foot version and how was that for you? easy? or a pain the you know what? With a Manfrotto 503 head and 351MVB2 legs, do I really need the Hercules head? … thats a chunk of change on top of the dolly… but if there really is a risk of it shearing off the plate as they say, then …. that’s another issue… what do you think? And.. is it really unstable without extra support? I’m not totally happy with the shots I have seen from the traveler – feels to me that the dolly moves are a hair too short in many cases in work I’ve seen online. So that extra foot seems necessary – what are your thoughts on this? I have the V2, and loaded up with camera rods and Manfrotto head, sitting on top of hercules head, it bows at both ends, which is incredibly frustrating.